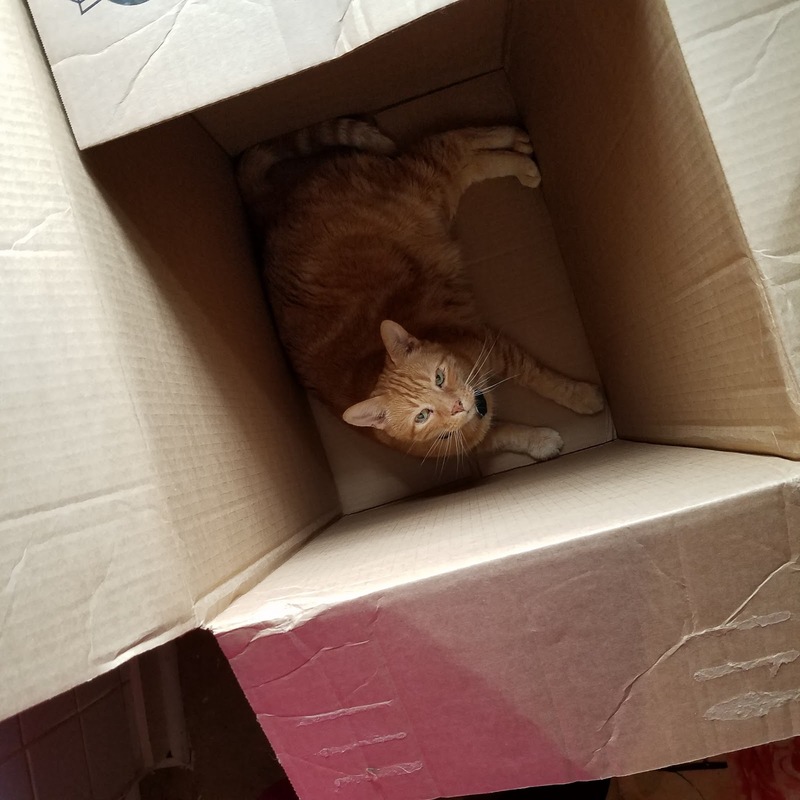 I got a bigger box! Mom said she wanted to make up to me for NOing me. Okay. I can handle that. It's like a whole apartment it's so big. 'Scuse me. I'm going to have a nap in my box. Just because I was sticking my head in there does not mean you should NO me. So there's electric cords. What are electric cords? It smelled good, though, and I could not resist. Next time I will do it while you are sleeping Mom. 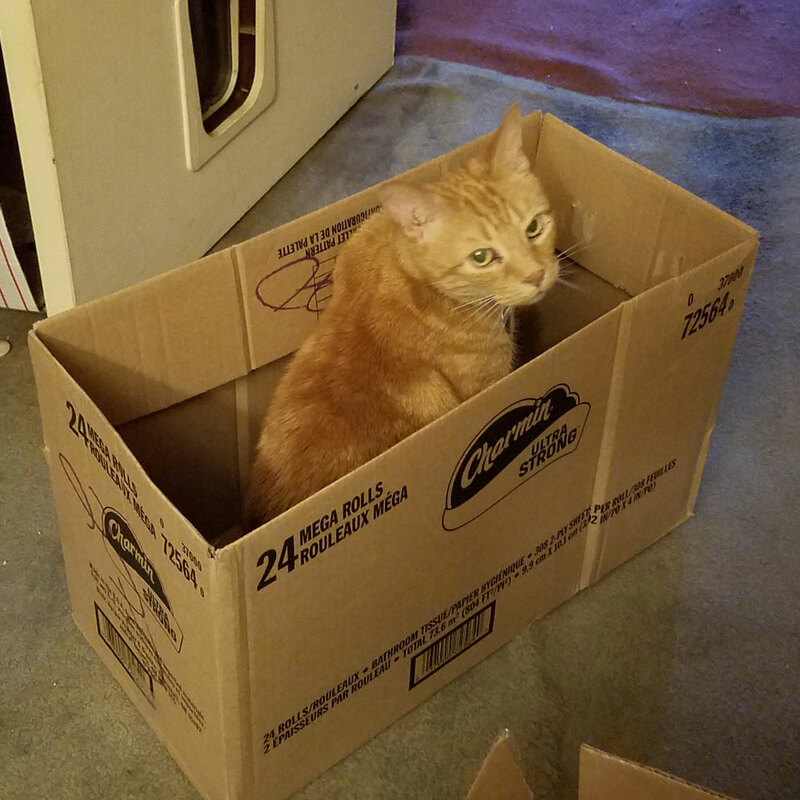 I might mail myself somewhere if you keep making me leave good smells alone. 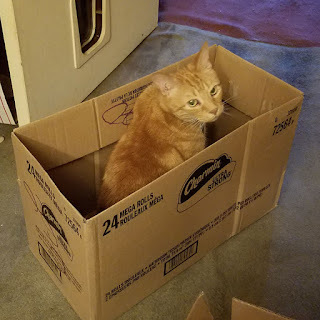 I already have a box. like it was my fault. I ran for the hills. Just because Boni Maroni is 17 is no reason to yell at me without yelling at her too. Totally not fair. Nobody was bleeding. Now I'm only allowed in Boni's part of the house when I have snoopervision by a human. Boni gets the kitchen part of the house. Not fair. I gobble. I am ashamed. Wait. I am not. I am a cat. Anyway, I gobble and barf. So now I get about a squillion little meals during the day so I do not barf. 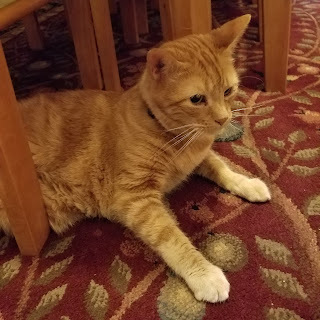 Mom's asleep at night, though, so I could not have my little meals. She got me a feeder. Twice a night I get feeds. Yay! This is the one she got me. I think she makes two or three cents if you buy it through that link, but I wanted to show it to you. I am happy I get feeds at night. What is this "I'm too tired to help you blog today" thing? You said that yesterday so you better help me blog today. Oh you are helping me blog now. Can you put fresh food in my bowl now? I heard about this thing called #whiskerwednesday. I can do that with my long, curly whiskers. You can not see all of them in this photo, but I have ginger, white, and a couple of black whiskers. Do you have long whiskers? Or shorter whiskers? Do they curl? What color are they? Do you have them on your blog or twitter??? Tell me (here or @Boots_OITNB ) and I'll come see. 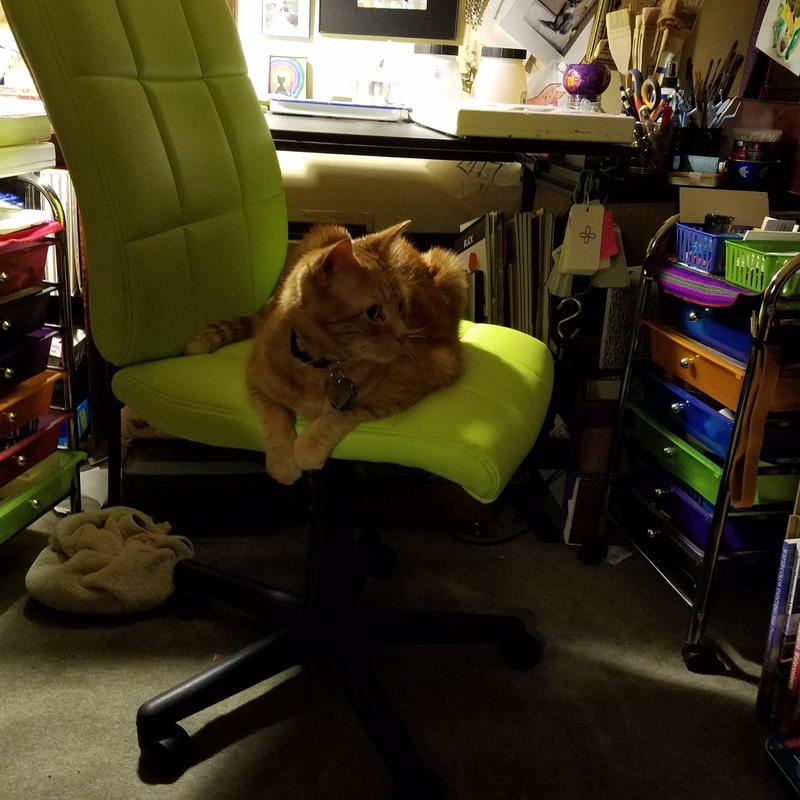 I snoopervised Mom in the studio today. It was hard work. She is on vacation so she was painting "anything I want for a change". Whatever that means. She can not be a slacker on my watch, though. 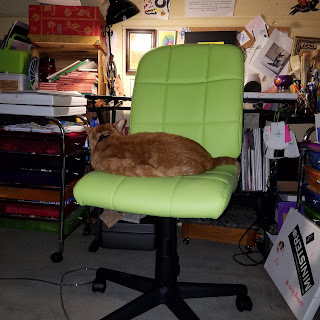 I snoopervised for a while from the lime chair. Why does she have furniture that hurts your eyes? Look at that organizer too! More lime in there! I may need a white cane if this keeps up. 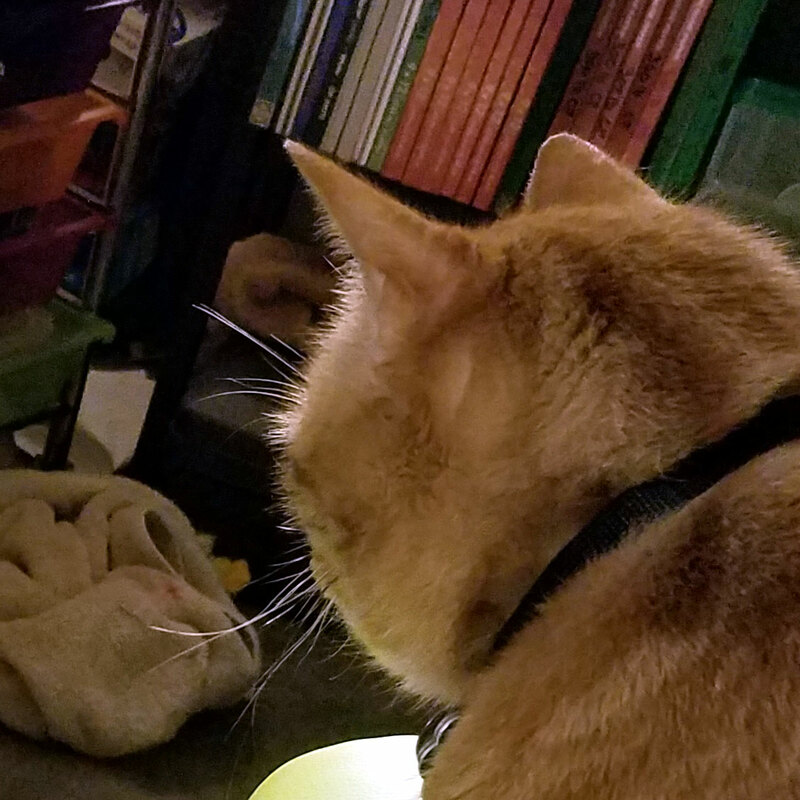 Mom says she's too busy to help me blog today. She's on staycation! How can she be too busy? 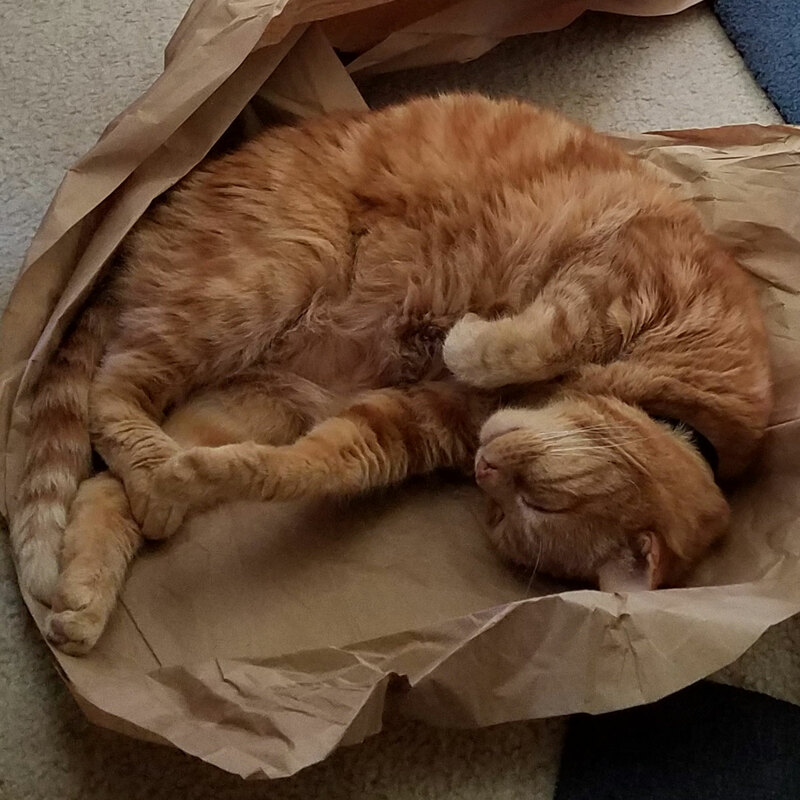 I was just sleeping on my favorite crinkly paper. What's so cute about that? I don't think I'll ever understand humans, but I can figure out how to make them do what I want. Cute works. I gave Mom the back of disdain like I learned from Max. She would not give me more food. I am being starved. Send kibble.